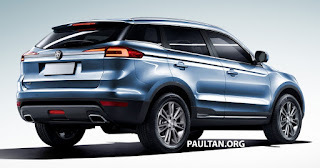 Kuala Lumpur, 29 May: Everyone but Dr Mahathir Mohamad wants to believe that there would now be hope for the long-suffering Malaysian national car after Proton finally signed the crucial deal with China's Geely. 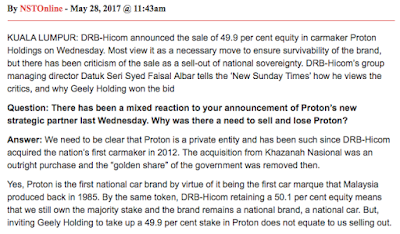 I was beginning to wonder, though, if Proton itself was going to speak out for Proton against its former Chairman and advisor. 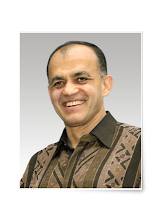 Then someone referred me to the interview in the NST Online with DRB-Hicom boss Syed Faisal Albar. Couldn't have been more timely. 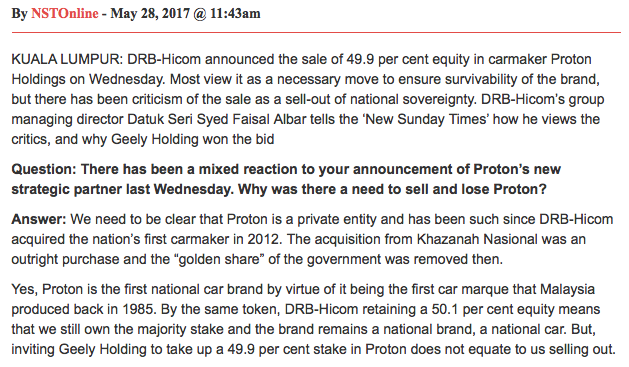 You can read Syed's full interview with the NST Online h e r e.
Ideally, we should hear from Syed Mokhtar himself about the deal with Geely and his plans for Proton but he's been known to be extremely media-shy, even before the days when they started calling him Dr Mahathir's "blue-eyed boy". 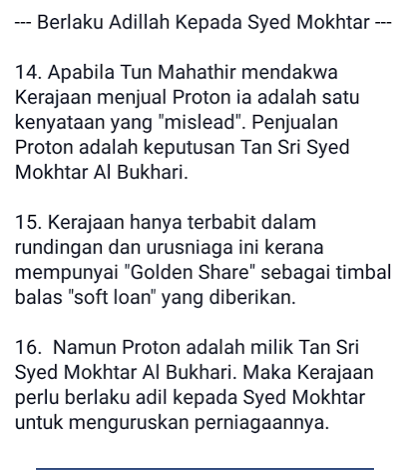 Plus, I think we can consider that DRB boss Syed Faisal Akhbar was speaking also for his boss Syed Mokhtar during the interview with the NST Online. I could almost hear him - Syed Mokhtar himself, I mean - saying it ..
Malaysians will once again be proud to call one of their own." 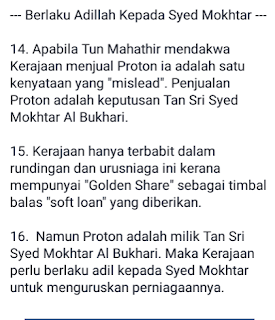 Still waiting for your link to the "allegation" made by The Edge that 42 billion was missing from 1MDB. Or you might want to study their very detailed financial flows diagram (concurred with by the DOJ, Singapore and Swiss authorities) that make it clear what a crook your main client is. How embarrassing if some of that cash trickled into LockyBlue Sdn Bhd, eh?